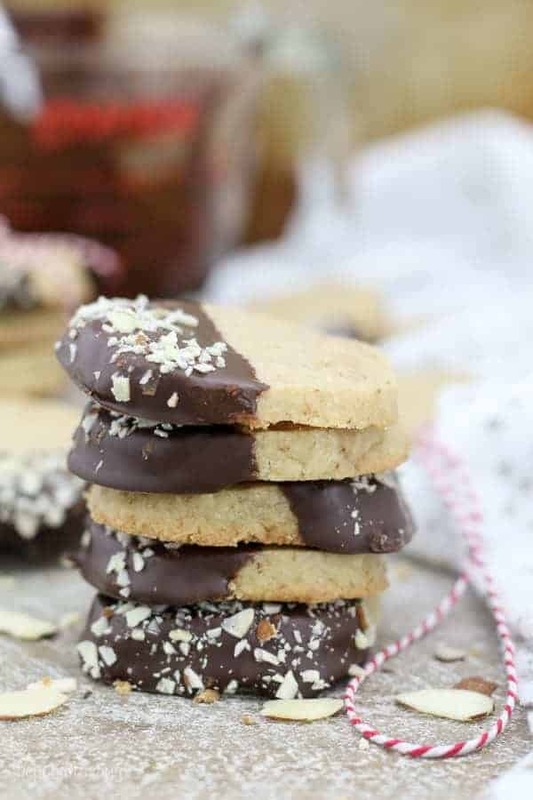 These Chocolate Dipped Espresso Shortbread Cookies are a traditional buttered shortbread cookie made with espresso powder and dipped on chocolate. I’ve been lying if I didn’t tell you guys that I’ve had this recipe since before Christmas. In fact, I actually included these cookies in my Christmas baskets. 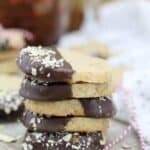 Of course during the I got too busy to share these with you and so I decided to save this recipe for Valentine’s Day. I’m a huge believer in homemade gifts, such as cookies. It’s even better when you have cookies that can be prepared in advance and frozen. Well this Valentine’s Day I won’t be doing anything sweet in my kitchen because we are on the major wedding diet and that means no extra sugar. That’s right, no chocolate covered strawberries for me this year! 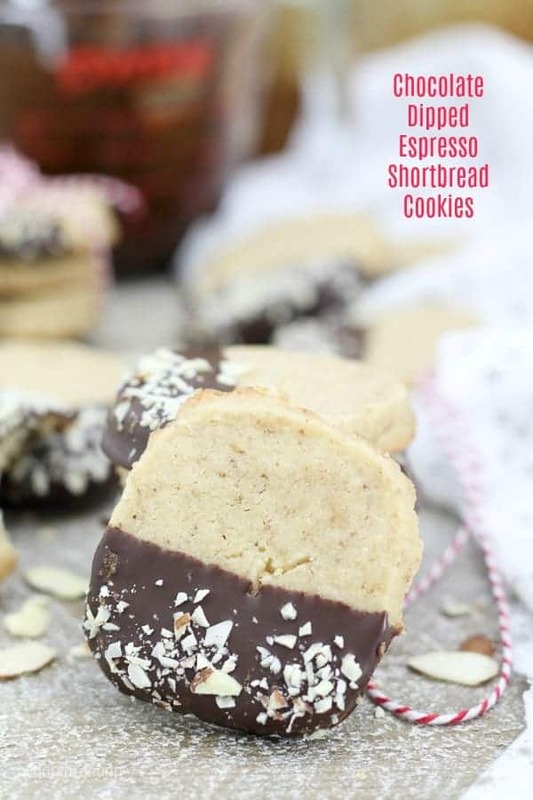 However, YOU my friends should absolutely make a batch of these Chocolate Covered Espresso Shortbread Cookies for your loved one, friend or coworker. This recipe is adapted from my Cranberry Almond Shortbread Cookies which is adapted from a Better Homes and Gardens recipe. 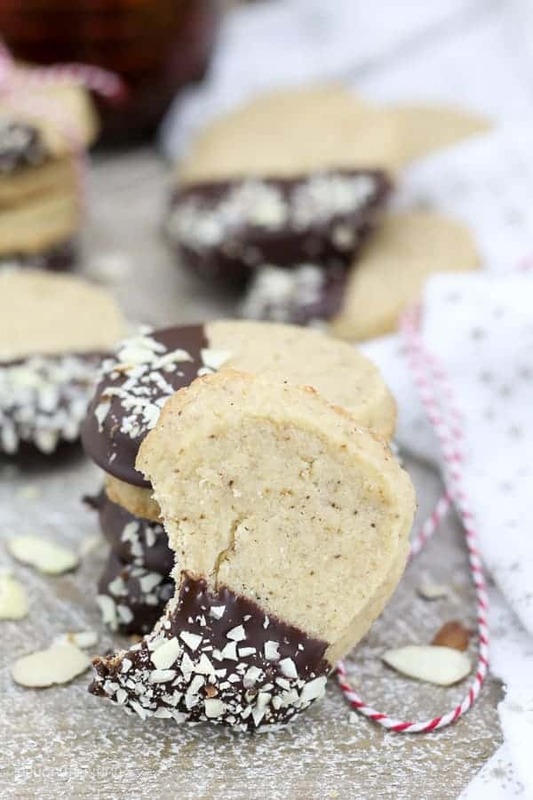 Generally, when I think about shortbread cookies, I think they are usually crumbly and crunchy but these are exactly the opposite. They stay nice and SOFT and just sort of melt in your mouth. 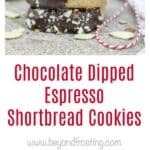 I love baking with espresso because it’s add another level of flavor. At one point, I was just breaking off pieces of the dough for myself before I baked them. Also, I kept these in my freezer with the intention that I would be sending them all out in cookie basket, but as per usual, I find myself dipping into my cookie stash. You have to plan ahead when making shortbread cookies because they need at least 2 hours in the fridge before slicing. The other trick I learned is that your dough won’t really come together in the bowl. It gets very crumbly, and then you need to use your hands to work it into a solid piece of dough. Once these are sliced and baked, I like to dip them in a little dark chocolate. 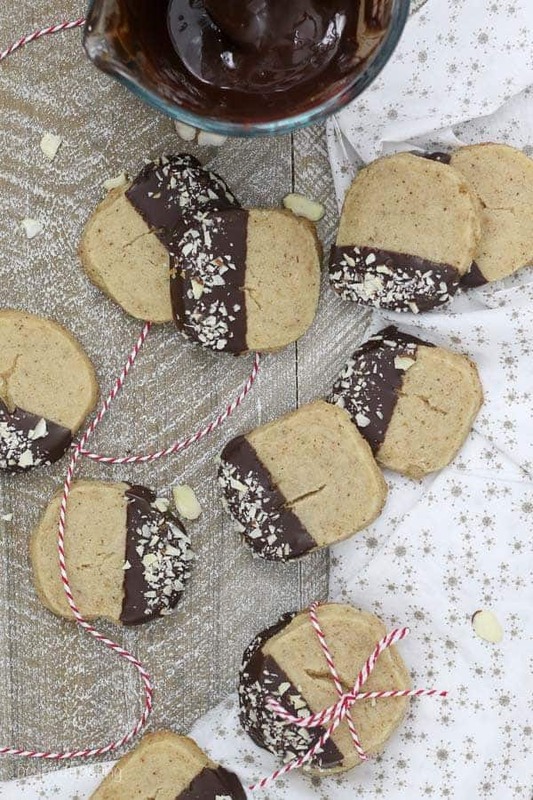 Who doesn’t love a cookie that’s been dripped in chocolate? Definitely don’t skimp on the chocolate. Get yourself a nice high quality chocolate! This post has a little more meaning to me than just your average cookie post. Today I am joining a bunch of other food bloggers to help raise awareness for childhood cancer. This is the second year for our Valentine’s event. 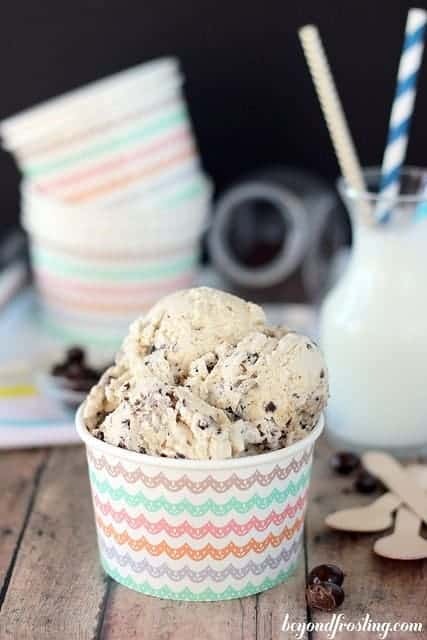 In a large mixing bowl, beat the softened butter together with the sugar and the vanilla extract. Beat for 2-3 minutes until smooth. Next add the espresso powder, salt and flour. Use your mixer to beat in about half of the flour and then switch to a wooden spoon or your hands to stir in the remaining flour. Divide the dough in half and shape into 1 ½ inch thick logs. Wrap in plastic wrap and refrigerate for at least 2 hours. When ready to bake, preheat the oven to 375° F. Line a baking sheet with a silicone baking mat. Slice the dough into ¼ inch slices. Bake for 10 minutes or until the edges start to brown. Allow the cookies to cool for 10 minutes and then transfer to a wire rack to cool. If any of your cookies are misshaped, use the flat edge of a knife and press the edges towards the center of the cookies right when it comes out of the oven. Cool the cookie completely. For the topping: In a microwave-safe bowl, melt the chocolate in 15 second increments, stirring each time until the chocolate is melted and smooth. Dip half of the cookies in the chocolate and tap it against the side of the dish to remove excess chocolate. Sprinkle with crush almonds and place on a silicone baking mat and allow the chocolate to set. Refrigerate to allow the chocolate to harden quicker. These can be frozen in an airtight container. Allow to thaw in the refrigerator. See what everyone else is sharing! Mmmmm! These look great! I love a good shortbread cookie.